What’s the best way to keep warm and have fun in the winter? Keep moving! Here are some great ways to get on the move this winter. This motorized winter sport is hugely popular in Manitoba. You will find groomed trails in every region of the province. Visit SnoMan to find out about conditions on the more than 12,000 kilometres of designated trails. Getting from point A to point B is a pleasant journey when you’re on cross country skis. Throughout the province, including St. Malo Provincial Park, Windsor Park in Winnipeg and Riding Mountain National Park, trails are groomed by volunteers who love the sport and Manitoba’s great outdoors. Whether you dig out your parents’ old snowshoes or rent a high tech pair, snowshoeing is an excellent workout. Make short work of snow drifts while enjoying the scenery at Birds Hill Provincial Park, Oak Hammock Marsh or another favourite snowy spot. Combine the fast-paced sliding fun of tobogganing with the air-filled cushion of a rubber tube and you’ve got a winning combination for a day of winter fun. Try snow tubing at Adrenaline Adventures, where there are several lanes, including some extreme snow tubing lanes filled with bumps and jumps. 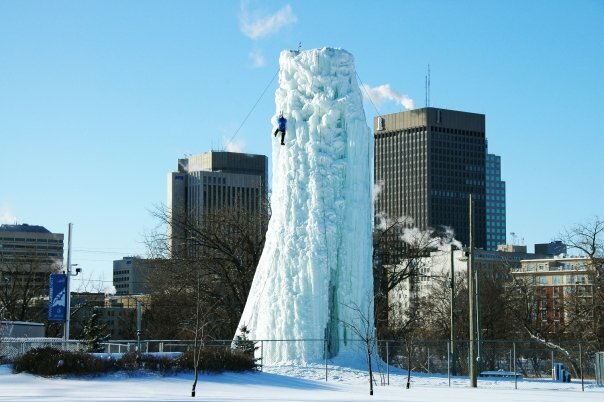 If you’re looking to get a step up on winter, try the Ice Climbing Tower maintained by the Club d’escalade Saint-Boniface. This three-sided permanent ice tower in the heart of St. Boniface offers varying degrees of difficulty. Equipment is available on site, while club members enjoy a great discount. Get your mush on at the Hudson Bay Quest, a wilderness race that covers 354 kilometres of Manitoba’s north. Come cheer on the racers at the starting line in Gillam on March 13 or at the finish line in Churchill.